What's Happening Now? Check in here for weekly updates on farm life as seen through the eyes and experiences of our current volunteers. Check in here for regular updates on farm life as seen through the eyes and experiences of our current volunteers. ¿Cuáles son las últimas noticias de la finca? Haga click aquí para ver actualizaciones frecuentes de la vida en la finca desde la perspectiva de nuestros voluntarios actuales. Turmeric super food and super medicine! Super food and medicine Curcuma! As a super-food full of rich nutrients, turmeric can be used as a spice, a natural coloring for food and fabric, and a remedy for many health related issues. Turmeric is native to Southeast Asia, specifically Indonesia and southern India, where it has been used for thousands of years as a spice and medicinal herb. Turmeric is a very commonly used ingredient in Indian cuisine and is the main spice in curry. Because of its bright, deep yellow color, it is used to give mustard its yellow color. 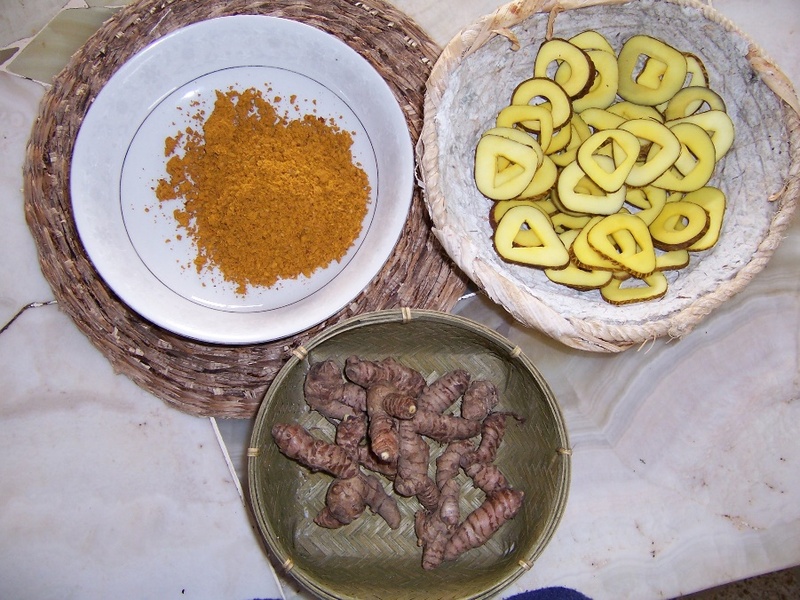 Turmeric has a warm, bitter taste and is added to many food dishes, such as willows, curries, soups, meats and rice dishes. The turmeric spice can be added to nearly any dish for a little extra flavor and color, as well as for its medical properties. The turmeric plant is a perennial, broad-leaved plant that can be grown in diverse tropical conditions. It thrives in fertile soil and shaded areas but will also grow in full sun. The entire plant is edible, including both fresh and dead leaves, the rhizomes and shoots of the turmeric plant. In terms of food and drink, turmeric, in all its forms, can be used in a number of ways. It can be added when cooking or steaming vegetables, added to please rice dishes and curries, and added as a spice to lentils or other bean dishes. It is a nice addition to salad dressings and willows. For a great intake of rich nutrients, add a teaspoon of turmeric powder to your daily smoothie, juice, or any food dish. Turmeric is an excellent source of manganese and iron as well as a good source of vitamin B6 (pyridoxine), dietary fiber, and potassium. The main active ingredient in turmeric is curcumin, which has powerful anti-inflammatory effects and is a very strong antioxidant. Therefore, turmeric is a great antioxidant and is given to treat inflammatory conditions such as arthritis or minor infections or even for the prevention and treatment of certain cancers. It may help to reverse some of the steps in the heart disease process. It is also used as a treatment for headache, pain, fungal infections, swelling, gallstones, lice, worms, and diabetes. It can be used to help with the prevention and treatment of Alzheimer's disease, cataracts, strokes, cystic fibrosis, and depression. In addition, turmeric has been tested to improve liver function and lower cholesterol. Due to all its benefits, curcumin and turmeric have become popular anti-aging supplements. 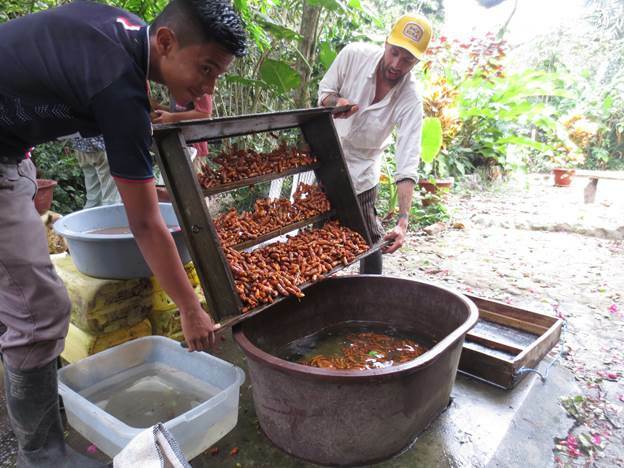 On the farm, we use turmeric to treat nearly all forms of injuries and illnesses. We had one case of fungus around the fingernail that persisted for 3 months. The finger was very red, inflamed, and painful for nearly three months. At first, we tried to treat it using a fungal cream, which slightly helped but did not heal it completely. It was a very painful fungal finger infection until one night when we tried packing turmeric around the finger with gauze and left it overnight. The next morning, there was no redness, no inflammation, and no pain around the finger. Turmeric was our magical cure. Another time, we had a case of a fungal infection on the scalp. We used turmeric on the scalp, and the fungal infection almost immediately. We use turmeric as an antiseptic - extracting the liquid and oil that is released from fresh turmeric. Whenever someone has a throat, we recommend gargling with turmeric in the mouth, which tends to cure the sore throat. If you are interested in purchasing our turmeric, check out our local suppliers! • Rene Vela. Parque de la Carolina. 8AM a 2PM. Domingos en el Jardín Botánico, Feria Agroecológica Arte y Cultura. • Puesto de Rene Vela, Sábados de 8AM a 1PM. Frente a Radio Latacunga. Please see the Spanish version. Rio Muchacho Organic Farm and Accommodation offers a beautiful place for guests to stay and relax. You can spend your time relaxing in a the tranquil environment or explore the farm and local area by yourself or with the help of a guide. Sign up below to get more information about our amazing services at Rio Muchacho! ¡Regístrese a continuación para obtener más información acerca de nuestros increíbles servicios en Río Muchacho! ¡Obtén noticias de la finca! Enter Rio Muchacho Organic Farm:..Ingrese "Rio Muchacho Organic Farm"